April 13, 2018 By Gary L. Shultz, Jr.
Butterfield, Rosaria. 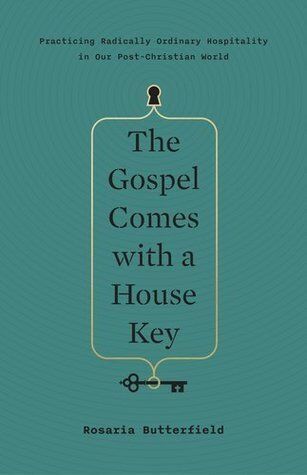 The Gospel Comes with a House Key: Practicing Radically Ordinary Hospitality in Our Post-Christian World. Wheaton, Ill.: Crossway. 240 pp. $19.99. Rosaria Butterfield defines radically ordinary hospitality as “using your Christian home in a daily way that seeks to make strangers neighbors, and neighbors family of God” (31). Such hospitality makes your home a hospital, a place where people can find healing and grace, physical and spiritual good. It makes your home an incubator, a place where people can be built up, supported, and strengthened in Christ. Butterfield uses the term “radically ordinary hospitality” because what she proposes is supposed to be ordinary for Christians. Welcoming strangers and neighbors into our lives and homes should be our default lifestyle. Jesus modeled such hospitality, the Bible commands us to practice this kind of hospitality, and the church is meant to live out this kind of hospitality. Unfortunately, this way of life is all too rare, which is why it is radical. We tend to view our homes as sanctuaries, places we can retreat from the world instead of opening up to the world. We think hospitality means hosting our friends and church members, without giving thought to our relationships (or lack of relationships) with people who aren’t like us. We fear not having enough to give, or not having nice enough things to give. We make our clean homes or nice possessions into idols, thinking it more important to have clean carpet or nice furniture than people coming into our homes who might mess those things up. We must learn to follow Jesus’s command and example, to make it ordinary. Butterfield makes the biblical case for such hospitality, but what makes her book unique is how she demonstrates what it looks like and the difference it makes, mostly from her own experiences. For example, she opens the book talking about her neighbor, Hank. Hank was a recluse who played loud music at odd hours, owned a hundred-pound pit bull whom he allowed to roam the streets, and didn’t mow his lawn regularly. They knew God had placed him next door on purpose, however, so they reached out to him, prayed for him, and gently rebuked neighbors who talked bad about him. God would end up doing some amazing things in Hank’s life, and in the life of their neighborhood, through simple things like helping Hank find his dog when he ran off, being consistently friendly to him when others weren’t, and opening up their home to him. Butterfield recounts her family’s relationship with Hank over several years, in all of its ups and downs, throughout the book, continually noting how God used their ordinary hospitality for his glory. She relates many other personal examples as well, from her neighborhood, her church, or years of fostering children, adopting several of them. She never does this in a “look at me” way. Rather, she uses her experience to show what hospitality looks like and how anyone can do it, even with a limited budget, multiple kids, or a small house. She also gives all kinds of practical instruction on what has and hasn’t worked for her and her family. Butterfield rightly stresses that our witness in a post-Christian culture demands a lifestyle like this. In a world that increasingly mistrusts Christians, unbelievers must see that we live what we say. In a world where even believers increasingly are disconnected from churches, we must work hard to connect beyond our worship services. Radically ordinary hospitality is not a quick fix and it is not always easy. It is, however, Jesus’ way of bringing people to faith and helping them mature in their faith. It is a lifestyle all of his followers must learn to live.